The Depth Refinement tool automatically improves the contours of objects in the depth map. YUVsoft offers this auxiliary tool for Stereo Generator; it can easily correct common depth map defects like edge mismatches and blurry edges. YUVsoft Depth Refinement automatically detects edges in the depth map and corrects their positions using color information from the source frame. You can set both the Refinement radius and Edge sensitivity—the lower the value you select, the greater the number of edges the tool detects. For lower values, it only detects sharp edges. You may decide not to process weak edges to save time, but for video with large parallax, you should perform this processing to get better-quality results. YUVsoft Depth Refinement tool improves an object’s contours in the depth map and places these contours so that they conform precisely to the original image. Both of these capabilities help you achieve the best results in the subsequent stereo generation process. 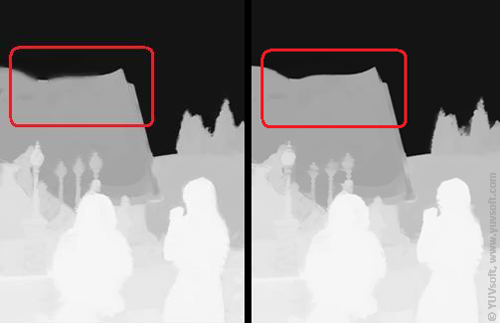 Depth maps corrected in such a way can be used by YUVsoft Depth Propagation plugin. Depth Refinement plugin for Adobe After Effects.